...in these four sacred sanctuaries. 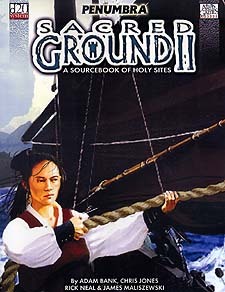 Sacred Ground 2 presents four more holy sites to use as PC home bases, as settings for your next adventure, or as lairs for your characters' most powerful enemies. Each entry provides location maps and fortifications, NPC stats and backgrounds, and plot ideas to bring the site to life. * HAI SHEN GONG: A vibrantly colourful middle Kingdom temple sits atop a wind-blasted cliff overlooking the crashing waves of the dark sea below. The head priestess personally attends to the fiery beacon that warns ships away from the dangrous shoals... and from the sacred creatures hidden within the cliff itself. * CRECHE HOSPICE: A small country estate houses an unfinished temple complex and the headquarters of the Creche Knights. The hospice is pilgrimage site, hospital, garrision and inn all at once, but also a prison for an entity called the Blasphemer, which prophesies that other creatures like itself will soon rise to plunge the religions of the world into chaos. * THE ORACLE: This ancient mountain tower is kept by mystics dedicated to the Lady of Fate, and is home to the goddess's oracle. At the request of supplicants, this young girl can plumb the depths of history and unravel the threads of destiny itself. * EARTHBLOOD GROVE: On the edges of civilization is an old-growth stand of hardwood trees with the reputation of being haunted and filled with strange fey creatures. Those concerned with such things know the secret of the forest: it is a druidic grove with a powerful natural relic hidden in its heart. Require the use of the Dungeons & Dragons Players Handbook, Third Edition v.3.5.